Deep, golden color. Spicy, with huge amounts of hops and malt, Fred can be enjoyed immediately. But it can also be cellared, taking on different flavors with time. What is a barleywine? Who cares? I like barley… and I like wine. (Actually, when we bought this beer the guy behind the counter (Jim was his name) said this beer was “big”. I think a 10% ABV makes any beer big.) I love the name too, more of the brewery than the actual beer. But once learning the history behind the name Fred, I was intrigued. Sort of how Rogue makes unique brews, Hair of the Dog Brewing does just the same. The name behind this beer has been writing about beer for a LONG time. Hopefully someone will name a beer after me one day. The initial flavor explodes on your palate with a combination of carbonation and utter sweetness. Not chocolate sweet per say, but a light summer based fruity sensation. (Drink the beer, you will see what I mean.) The aftertaste wants to hang around, and while there are subtle hints of the brew that stick around, the aftertaste is quick to leave your tongue. It sticks around in your throat more than anything. Each sip of this beer leaves me reaching for another… it’s a VERY well balanced beer for being 10% ABV. 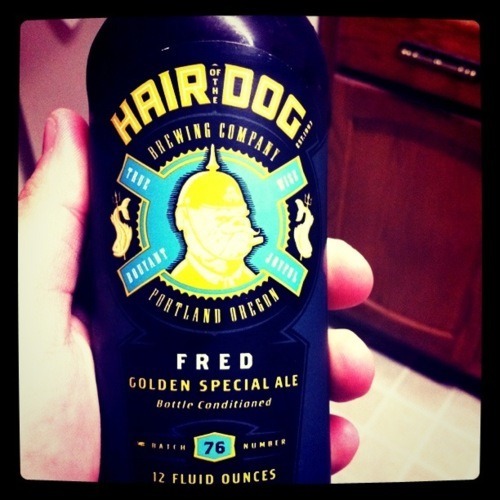 Hair of the Dog Brewing claims to be loyal, pure, and faithful. They also claim to have a wet nose. Regardless of their nose, this beer is delicious. I would see this as a beer to drink on celebration, not your everyday brew. I love it… bottoms up people! Hair of the Dog apparently names their beers after people. This one is named Fred. Fred pours out as a golden wheat color and pretty thick, too. The bottle warns of sediment possibly being in the bottom and cautions the drinker to pour it slowly. The beer smells slightly fruity and slightly spicy. The first sip has so much flavor it almost knocks you out. It’s very rich, buttery, and a little bit carbonated. It reminds me of eating a Werther’s candy. It’s smooth and velvety, and I honestly love the flavor. It also reminds me a bit of another beer I really like, the Sam Adams Imperial White. This beer is a bit too rich (in flavor and in price) to drink every day, but for special occasions, I’d say go for it!